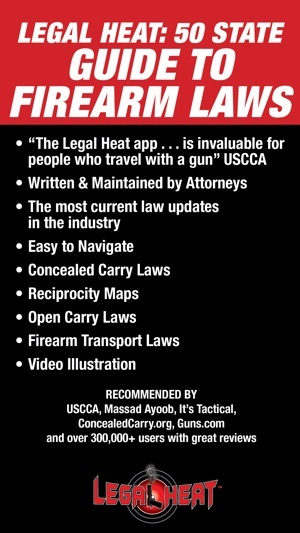 "The Legal Heat app for iPhone is invaluable for people who travel with a gun" - U.S. Concealed Carry Association (Vol. 9, Issue 4). 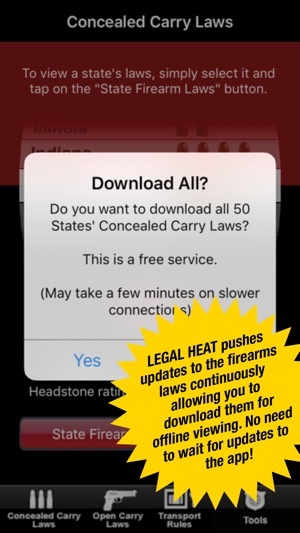 Legal Heat, one of the nation's largest concealed firearm permit training companies has improved the 50 State Guide to Firearm law app featuring CCW law and open carry law coverage for all 50 states. --> OFFLINE VIEWING: Once a state page is downloaded it is always available for offline (no service) viewing. -->Reliability: We are not only firearm enthusiasts; we do this for a living. 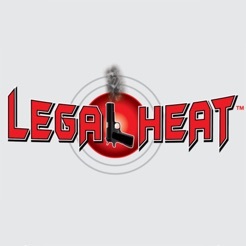 Legal Heat will always be updated and maintained, we're not going anywhere. -->MUCH MORE: Video overviews of key laws (with more being added regularly), Open carry laws, top of the line functionality, and much more is coming soon. Regular, consistent periodical updates to changes in the firearms laws and regulations for the states of Alaska, Utah, Arizona, Indiana, and Nebraska, for both open and concealed carry laws. 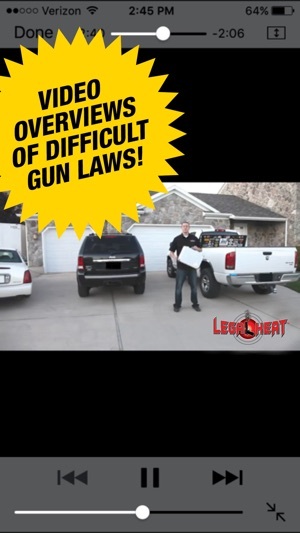 - Transport Laws: In depth explanations & VIDEO OVERVIEWS on how to transport a firearm in your vehicle, on an airplane, what to do during a police encounter, AMTRAK, Tribal Land, National Parks & Monuments, and MUCH MORE! - Notify Us of Changes in the Law: With the push of 1 button you can notify Legal Heat of any changes that occurred in your home state. Once we become aware of any changes in your state's law we will update the app within 24 hours. - Concealed Carry Laws: Including prohibited areas (both state and federal), duty to retreat laws, constitutional provisions, special notes, etc. - Reciprocity AND Reverse Reciprocity Maps: See where your permit is valid, and what permits your state accepts. - Open Carry Laws: Concealed carry isn't the only way to carry, see what states allow open carry and where you can and cannot exercise that right. MUCH MORE: We try our best to offer the absolute best product on the market and are constantly adding new features. If there is something you would like to see added or if you come across an error in the law, use the "Notify Us" feature inside the app) and we'll do our best to improve. AUTO RENEWAL FEATURE - Payment will be charged to your iTunes Account at confirmation of purchase. Subscription automatically renews unless auto-renew is turned off at least 24-hours before the end of the current period. Account will be charged for renewal within 24-hours prior to the end of the current period, at the current subscription price. Subscriptions may be managed and auto-renewal may be turned off by going to your Account Settings after purchase. 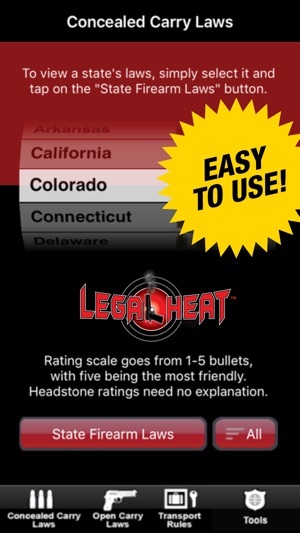 If you purchased the Legal Heat 50 State Guide prior to our free version, thank you for your support! You get the subscription for free! We hope to provide additional value with future features that will allow you to support us. In the meantime, feel free to leave a wonderful review! • Fixes issue with grandfathering our pre-September 2014 users. We've worked hard to make this the best release ever and to fix the issue with grandfathering our pre-September 2014 users. Because there is no way to fully test the fix until after we release a new version (yes, it's one of THOSE kinds of bugs), PLEASE use the Tools -> Send Feedback to let us know if anything is wrong. Luckily I purchased this app 5 years or so ago so it is not a subscription for me. Totally worth the yearly price as all the info is right there! No matter if you travel occasionally for vacation or regularly for work, this app is a must for anyone who wants to stay within the wall if confronted by law enforcement for whatever reason. I would hate to go to jail on a technicality and this app aids in helping me! Sometimes for some states the law is not clear, I have called down to a governing body for clarification before. Totally recommend for keeping up with laws if you have a CWP, even if you don’t, some states allow carry without! (Lucky) if open carry is your thing, there is a section for that as well! Most recent update resolved the grandfather issue for us long time users. 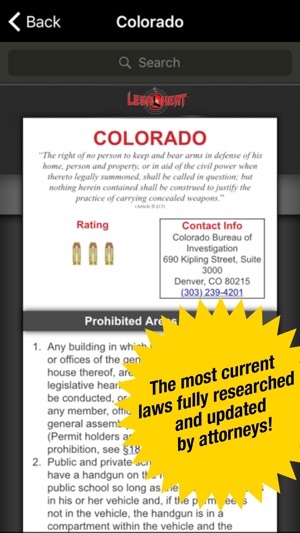 It's a great app and a must have if you carry your weapon to other states. National Training Solutions, Inc. recognized the problem with the first update-worked diligently to fix it. Sent email updates regarding their progress and never stopped working it. You can't ask for better app developer support. Try for free-buy with confidence/subscribe for the updates, they're real updates on the concealed and open carry laws. ! I love this app. Very handy while traveling. Best tech support I've ever ad from a purchased app. Bug was fixed very quickly after notifying them of the problem. 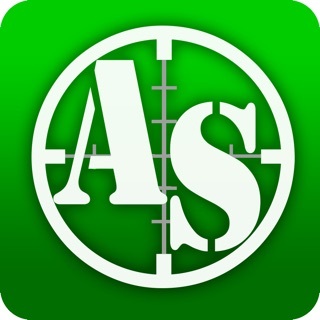 I would highly recommend this app to anyone that wants to carry concealed firearm. I hope they rethink their subscriptions though. Most people I know won't get the app if they have to pay for a subscription. Thanks Legal Heat team for all your help!